Recent news flashes for bears: the 11/17/18 posting “Teddy Bears’ Picnic Day” (with the customary bow to possible gay subtexts); and the 12/4/18 posting “Santa Barbara: smite him with lightning”, with image #2 — Corrado Parducci’s Horace Rackham Fountain at the Detroit Zoo (1939), featuring a pair of sculpture bears. 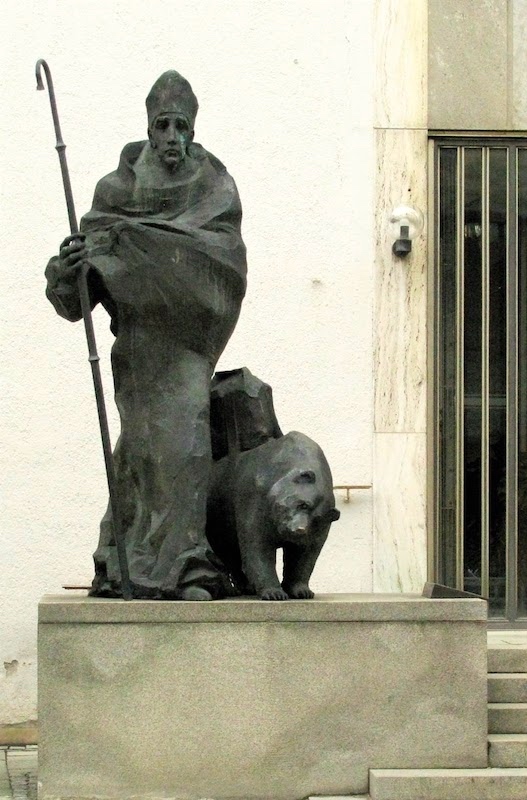 Now, continuing the lives of the saints theme, but disregarding the many saints named Ursus or Ursula, we come to St. Corbinian, the patron saint of bears (thanks to the 8th-century Miracle of the Bear). The Horace Rackham Memorial Fountain (1939), also known as the Bear Fountain, is a fountain located in the Detroit Zoo, Royal Oak, Michigan. It was designed by Frederick A. Schnaple (1872–1948) and sculpted by Corrado Parducci. The fountain consists of a large bowl supported by two standing bears — as well as several frogs, turtles and even a couple of seals — along with some granite putti on the outside of the fountain. …About this commission Parducci said, “I didn’t like that. I made it against my will. They wanted, Mrs. Rackham was sold on that, bears . . .
She wanted bears, and she had pots of money, so Parducci gritted his teeth and turned out a couple of bears — much loved bears, as it happens. A commission is a commision, and who knows how your work will be received. 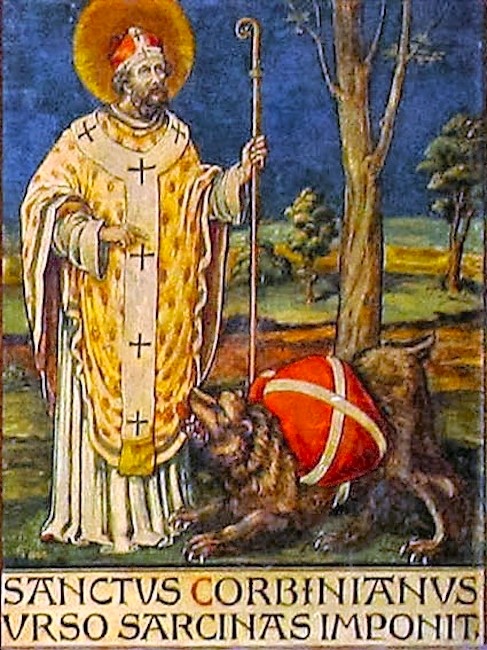 Saint Corbinian (Latin: Corbinianus; French: Corbinien; German: Korbinian; c. 670 – 8 September c. 730 AD) was a Frankish bishop. After living as a hermit near Chartres for fourteen years, he made a pilgrimage to Rome. Pope Gregory II sent him to Bavaria. His feast day is 8 September. 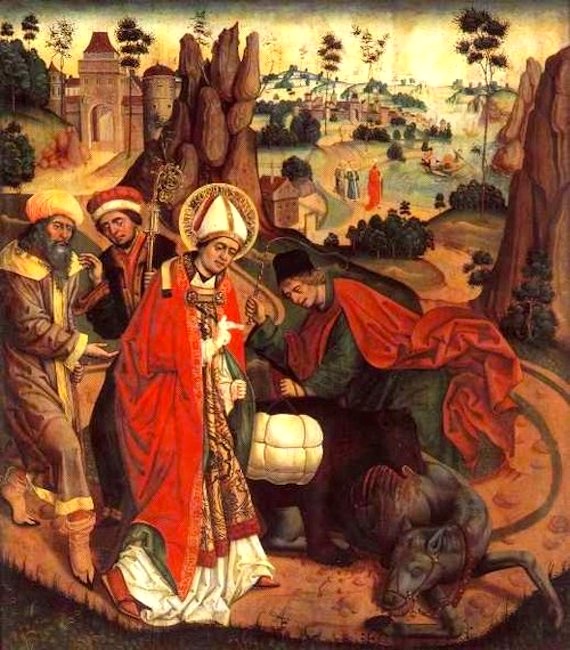 (#1) 15th century: Saint Corbinian depicted in The Miracle of the Bear (1489) by Jan Polack. Diocesan Museum in Freising, Germany. (#2) 19th century: Anonymous, St. Corbinian and the Bear, German c. 1870-1880. Panel in Freising Cathedral. (#3) 20th century: Klaus Blackmund, St. Corbinian. Monument for the 1,250th anniversary of the establishment of the diocese of Friesing. German, 1989. Munich, Maxburgstrasse. This entry was posted on December 5, 2018 at 9:47 am and is filed under Art, Language and animals, Language and religion. You can follow any responses to this entry through the RSS 2.0 feed. You can leave a response, or trackback from your own site. The bear in #2 does not look especially submissive.